The reservoir lies atop the glacial terminal moraine that stretches the length of Long Island from Bay Ridge to Montauk Point. Although it was built for the residents of Brooklyn, it lies almost entirely within Queens and is named after the Queens neighborhood to its north. On this undated topographic map, the reservoir is shown having three basins, of which only the middle basin has water today. To its east is an empty parcel at 160 feet elevation. This is the former Banzer’s Pond, which was filled in the 1930s following the Interborough Parkway’s construction through the Brooklyn-Queens cemetery belt. The largest of these, Cemetery of the Evergreens used to have its own ponds, which were filled to make space for more burials. The reservoir was part of the larger Brooklyn Water Works that collected water from reservoirs along the south shore, channeling it to a pumping station at the base of the terminal moraine. A steam engine pushed the water through a “force tube” uphill to the Ridgewood Reservoir. Construction began in 1856 and completed within two years. A third basin was added in 1891, in total holding 300 million gallons. As with the city’s other historic reservoirs, this one included handsome gatehouses and a house for the resident engineer. In the above 1859 Gustav Kraetzer illustration, its location made for an ideal attraction, as visitors strolled around its perimeter with views of downtown Brooklyn and Manhattan. That year the reservoir was completed. A massive celebration was held on April 28, 1859. In 1891, Highland Park was mapped on the western and southern sides of this reservoir, with landscaping by Central Park designer Frederick Law Olmsted. As with his other great parks, this one had a music pavilion, memorial, stone arches, winding trails, and picnic area in a forested setting. Eastern Parkway was extended that year to connect Highland Park with Prospect Park, but unlike the original Olmstedian parkway, the 1.4-mile extension doesn’t have the generous green shoulders and service roads. The park also has a depression that is filled with water for much of the year. As with Central Park, this park received active recreational items in the 1930s with tennis courts, playgrounds, basketball courts, and handball courts. As it is with Commissioner Robert Moses, there’s a negative side to his “park improvements.” The 18th-century Schenck farmhouse, used a park clubhouse was removed in 1940. Fortunately, the Library of Congress has detailed photos of the house, and the 1937 architectural survey of the Schenck farmhouse by the U.S. Department of Interior, should anyone wish to reconstruct it accurately here or anywhere. Not to be confused with the other Schenck farmhouse preserved within Brooklyn Museum. Also removed by Moses: the park’s Olmstedian aquatic garden and children’s farm garden. Moses also ran Interborough Parkway along the park’s northern edge. When the reservoir was assigned to Parks, it expanded the size of Highland Park to 101 acres. Presently, the paths around the former reservoir feature historical signs and railings, but instead of looking at water, one sees a depression filled with mature trees that grew after the first and third basins were drained. Although the Victorian Romanesque revival engineer’s house is gone, there are gatehouses and pumping stations along the perimeter path that remain unused. One can imagine them repurposed as nature centers, bike rental storage, or food concessions. Gatehouse 27 is currently being reconstructed. The future of the reservoir as a nature preserve has been assured in Jan. 2019 with the state’s designation of Basin 2 as a Class 1 freshwater wetland. Back in 2017, it was also added to the New York State Register of Historic Places, in recognition of its role in the development of Brooklyn as a city. The designation completes more than a decade of campaigning by retired high school biology teacher Mickey Cohen, the Highland Park Ridgewood Reservoir Alliance, and many environmental groups, including NYCH2O and NYC Audubon. As with many of New York’s historic sites, there are unbuilt plans in the drawer that would have compromised the history and nature of the site. In 2007 the city proposed active recreational use for Basin 1 with a running track, zip lines, climbing wall, and a soccer/cricket field. Basin 3 would have received a small turf field. On its face, the idea has precedents: Williamsbridge Oval is entirely designed for active recreation, and there’s also the Great Lawn of Central Park was built on the former Lower Reservoir. But the difference here is that those two former reservoirs were transformed into sports fields shortly after the water was drained. With Ridgewood Reservoir, it has a generation of trees that grew in the basins, hosting migratory birds on the Atlantic Flyway, and rare local species. The $50 million proposal meant the removal of nearly 500 trees. This resulted in an outcry of opposition from civic and environmental groups. Elected officials responded to constituents and the plan was shelved. This story is similar to the great reservoir of Central Park, which is also reserved for wildlife. On the official GIS map of Highland Park, the forested depressions of Basins 1 and 3 are visible, along with the naturalistic pond that is Basin 2. The park is a blend of decommissioned infrastructure, Olmstedian setting, and active recreation. It is administered jointly with Forest Park, located a mile to the east on the terminal moraine, sharing the same topography, highway, and history. Last night, more than 100 people came to see my presentation on hidden waterways at the A/D/O hall in Greenpoint, Brooklyn. It was a fitting location- Norman Avenue being named after Norman’s Kill, the old name for Bushwick Creek. Architects, engineers, historians, and students heard the stories of the city’s streams. In particular, I was pleased to meet Eymund Diegel, who shared maps of streams; and archivist Cynthia S. Brenwall, who will soon be publishing a book on Central Park with rare maps of its natural terrain. This book will certainly serve as a valuable resource n the park and I am proud to have my book cited in her work. I can be contacted by email or with a comment below for future speaking engagements. What a great task you have accomplished, Sergey! My older brother and I, and now my son, were always fascinated by the old water ways and streams. Being avid fishermen, we have fished and caught various species in some of these waters. 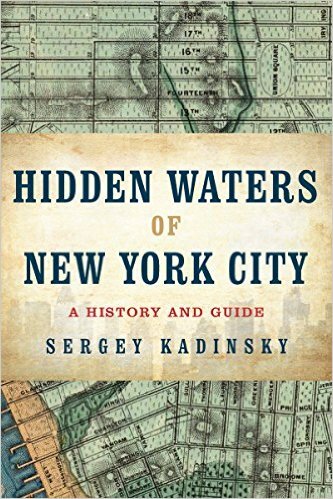 Just a thought: a great companion to your book would be an informal study/chronicle of what can be caught in these “hidden waters.” The average person usually scoffs when told there could be fish in an odd body of water. They have no idea! Thank you. Matt Sweeney Sr.